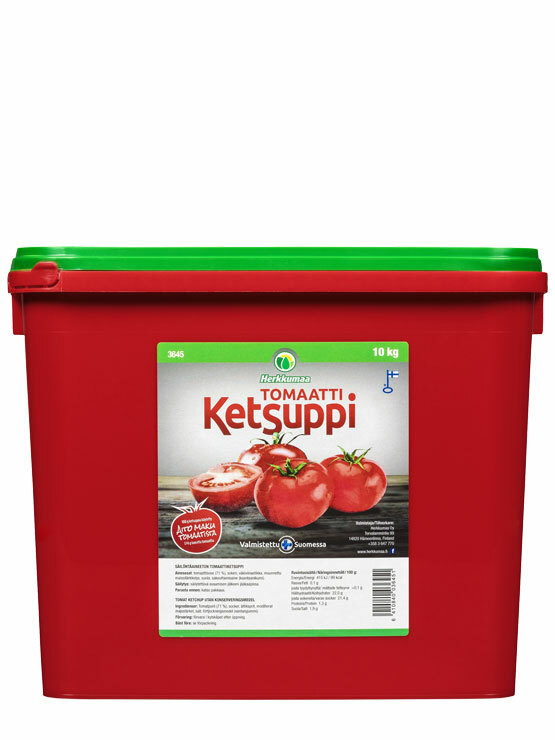 Herkkumaa’s tomato ketchup gets its flavour from the large amount of tomato: as much as 174 grams of fresh tomatoes have been used for every 100 grams of ketchup. For the best ketchup in Finland, we only use the traditional ketchup flavourings: vinegar, sugar and salt. Packed in an easy-to-open 10 kg rectangular container. The rectangular container saves up to 33% of space compared with a round container of the same volume. Ingredients Tomato mash (71 %), sugar, wine vinegar, modified corn starch, salt, thickener (xanthan gum), preservatives (sodium benzoate, potassium sorbate).